Representative of the Fletcher-class destroyers that formed the backbone of U.S. destroyer forces in World War II, USS Kidd is named for Rear Admiral Isaac C. Kidd, who was killed aboard his flagship, USS Arizona, when the Japanese struck Pearl Harbor on December 7, 1941. Kidd saw heavy action in World War II, participating in nearly every important naval campaign in the Pacific, winning eight battle stars. Kidd and her crew fought gallantly during the invasion of the Gilbert and Marshall Islands, the Philippines at Leyte Gulf, and off Okinawa, where she survived a kamikaze attack. 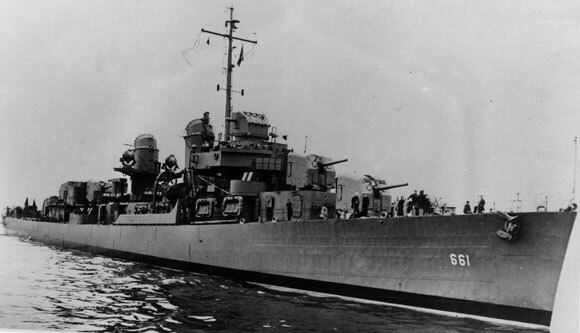 In 1951, the destroyer was deployed to Korean waters, where it won another four battle stars for service. 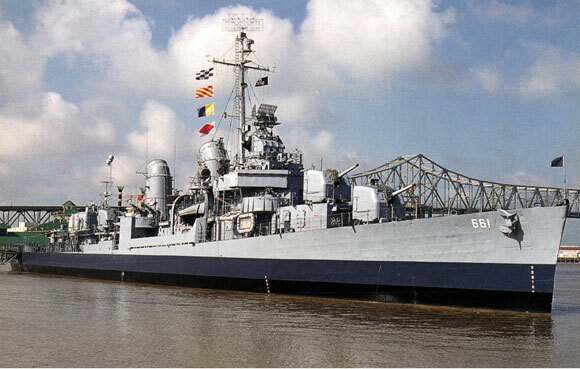 Decommissioned in 1964, Kidd entered the Atlantic Reserve Fleet and was berthed at Philadelphia until 1982, when ownership was transferred to the Louisiana Naval War Memorial Commission. Never modernized, Kidd is the only destroyer to retain its World War II appearance. She is now on public view as a museum vessel in Baton Rouge. Kidd conducts youth group overnight encampments. USS Kidd is a National Historic Landmark. Copyright © 1997-2008, Historic Naval Ships Association.